Now I know what most of you are thinking when seeing the word ‘hats’. That you’re not much of a hat person. Neither am I. Until I came across Stetson hats in Stuarts London. Stuarts are celebrating Stetson’s 150th anniversary by offering us a wide selection of their good-looking hats. I don’t know about you, but when I come across a new brand I like looking at the history of it and where the brilliant ideas first come from. When investing money in a new piece of clothing I have to know the ins and outs of the brand of clothing to make sure the money is being spent on something worthy. In 1865, John B. Stetson, with only $100 of capital set forth and created his company, striving to mark his stamp by ensuring quality, innovation and beauty within the hat industry. However, today the Stetson hat factory in Texas is still maintaining the quality and styling that the originator first set out to do. 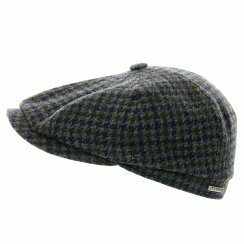 The hats produced have now become iconic to American heritage and workwear. Stuarts London offer two styles of Stetson hats; the flat cap and the newsboy. Which fabric? You name it they’ve got it; cord, cotton, wax cotton, wool, cashmere, suede and the whole works. I know you won’t be wanting to be looking like Del Boy or Uncle Albert from Only Fools and Horses but personally, I think these hats are beautiful and really pretty smart. So if you coordinate the hat to your style anyone could pull it off and look the sharpest in the group. How a hat makes you feel is what a hat’s all about!